Many people who have eating disorders know all about the adverse effects these struggles have on their health. From increased risk for heart disease to malnutrition and hair loss, eating disorders are serious health problems that deserve serious consideration and treatment. If you or someone you know struggles with an eating disorder, get help today to prevent concerns that can adversely affect both oral and overall health for a lifetime. You deserve to live a long, happy, healthy life filled with beautiful smiles, so get the help you need to kick your eating disorder today. Then, talk to your physician about improving overall health and your dentist about repairing your smile. Patients who struggle with bulimia can go hours or days without eating at all. They will then consume large quantities of food and induce vomiting. Similarly, patients with binge and purge disorder consume large quantities of food regularly and induce vomiting following meals. Both of these eating disorders can cause severe damage to teeth. The acids in the stomach will quickly dissolve and weaken tooth enamel and damage soft tissue, leading to an increased risk for tooth decay and gum disease. 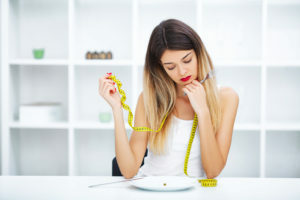 Anorexia sufferers forego eating altogether, and when they do eat, these patients consume inadequate calories to meet the needs of healthy bodily function. For these patients, teeth are weakened because they do not receive the appropriate nutrition to remain whole and healthy. If you’re currently struggling with disordered eating or have oral health concerns caused by your past struggles with eating disorders, let your dentist know. They can create a personalized preventive and restorative dentistry plan that will meet your unique oral health needs. You’ll need to start by repairing any damaged aspects of your smile. Once your teeth are adequately restored, your dentist can walk you through advanced in-office and at-home hygiene plans to strengthen and protect weakened tooth enamel. A dentist may also prescribe professional strength toothpaste or mouth rinse to provide higher levels of fluoride and more advanced antibacterial treatment on a daily basis to reduce risk for tooth decay or gum disease. At the Zionsville dental office of Angelo M. Julovich, DDS, we understand that countless people struggle with disordered eating. If you or someone you know suffers with oral health concerns caused by struggles with eating disorders, the Trinity Dental team can help. Dr. Julovich has years of experience offering the most advanced treatments to protect and repair your smile without judgment. Don’t hesitate to call our office if you experience toothache, dental damage, or any oral health concerns. We’re here to help whenever our patients need us, and we can often provide same day treatment for patients in need of urgent dental care.